All rooms have natural light and are of varying sizes, providing the option of choosing a room according to the number of participants. Projector, screen and paper board are provided free of charge. The Ballroom can host concerts, conferences, festive social events, and weddings. Guests reserving the Ballroom will also have access to the Salon. The Ballroom accommodates 6 to 7 round, 10-person tables. À la carte catering services can be ordered for an additional 20%. 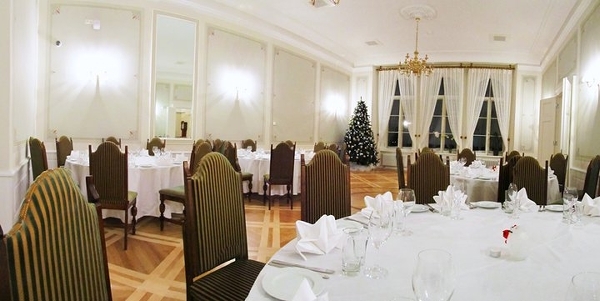 Reserving the Ballroom for seminars without catering services costs 640 € per day. Salon, fitted with antique furniture, can be used independently of the Ballroom for wedding ceremonies, business meetings and romantic two-person dinners. The room can accommodate up to 10 people for dining. À la carte catering services can be ordered for an additional 20%. Reserving the Salon for seminars without catering services costs 190 € per day. 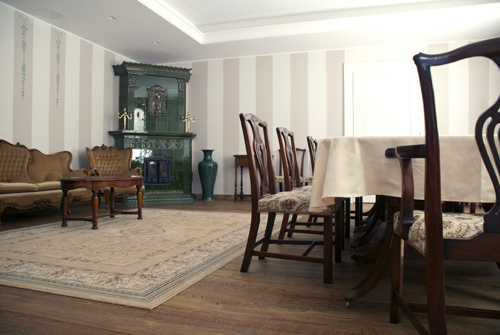 Furnished with antiques, the Fireplace Chamber includes a lovely rectangular dining table that seats 10 to 15 guests. There is also room for a musician to enhance the event with live background music. Soft armchairs and couches allow guests to retire from the dining table to enjoy coffee and cognac. À la carte catering services can be ordered for an additional 20%. Reserving the Fireplace Chamber for seminars without catering services costs 390 € per day. Seats 18 guests behind a majestic round table with ornamented high-back chairs; wonderful for official events. À la carte catering services can be ordered for an additional 20%. 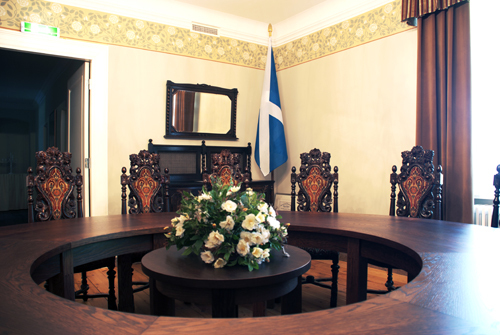 Reserving the The Scottish Hall for seminars without catering services costs 320 € per day.